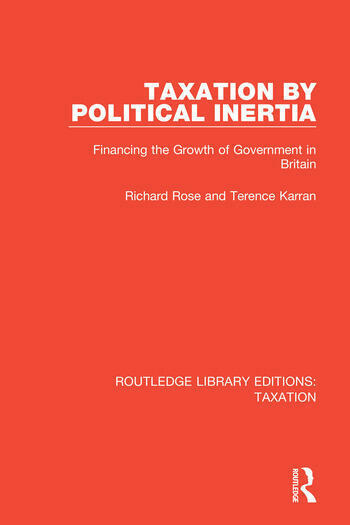 This book, first published in 1987, is a study of the political processes that underlie the determination of taxation – and much else – in the centuries-old government of Britain. Governments inherit a large legacy of policies, and it is the inertia force of past commitments that determine much of what a government does. This is especially true of taxation, and this book explores the forces at work on the policies of taxation. It also helps us understand what might be the future of taxation. 1. Why Inertia? Taxation as a Political Problem 2. The Great Identity: Revenue Equals Expenditure 3. Exercising the Taxing Power: A Public-Policy Model 4. Taxation in Practice 5. The Force of Inertia 6. Increasing Taxes, Stable Taxes or Decreasing Taxes? 7. Fringe Turning: The Chancellor’s Decisions 8. The Decisions of Citizens 9. What Scope for Future Change? Professor Richard Rose was Professor of Politics from 1966 - 2005 at University of Strathclyde.